I don’t use crème bleach on my face quite often, partly because my skin is sensitive and acne-prone. It’s only during special occasions that I opt for bleaching, that too, to brighten up my face and conceal light facial hair. Sometime back, when I had to attend a function, I decided to bleach my face two days prior to the event. It’s always a good idea to try anything, say, coloring your hair, going in for a professional facial, tweezing your brows, plucking/threading your upper lip hair, and of course applying bleach on your face a couple of days before any big event so that you do not sport an unnatural look. I had purchased ‘Ayur Silky Instant Bleach with Rose’ for this purpose and as per the instructions applied it to my face carefully. (You may read this post on step-by-step instructions for applying cream bleach.) I left it for 25 minutes and after I washed my face found that it had done little to conceal facial hair and blend them to suit my skin-tone. And as mentioned on its label, it didn’t make my skin any fairer. I have very sparse hair-growth on my arms and that certainly doesn’t need either waxing or shaving; so I tried using this bleach on my arms as well. This time, I left it on my arms for a good 35-40 minutes, but was not satisfied with the results. To conclude, I didn’t like this product and don’t recommend it. It is available in 20gm, 70gm, 250gm pack. A 20 g pack costs Rs. 30/- . I had purchased it too... the huge pack 250 gms one and it didn't work for me too. Jolen/Fem bleach are much better. I was kinda disappointed with this product. It doesn't work! Thanks for the super helpful review! This is a product I'm going to avoid for sure. I wish I had read this post before I tried this--worst stuff ever. i is worst..it uses boric salts and destroys the skin..my skin affected worsely..i leaves brownish patches and please never go for it..i still can get my original skin color..my white skin got blackened after using this and i still can't get back my color which i had earlier..please never damage the skin using these products..i personally suggest if u r white naturally never go for cosmetics ..if u do it actually reverses..
i also damaged the skin using this and cant recover original skin color.It has darkened my skin and burned out.I cant able to recover.It left dark patches and my skin looking aged .God please save me.I am dying ,the product and company should be banned.Help me out is there any possiblity of recovering my original skin. @Anonymous comment #7: Though it didn't bleach my skin, thankfully it didn't cause any harm to my skin. First and foremost go to a dermatologist and take his/her advice. As for home-remedies, you can check this post to get some tips. I m sorry it didnt suit u but ur method is wrong. U should never put bleach for more htan 15 mins!!!! that too only for fair skin. For wheatish complexion, only 10 mins. It clearly mentions that on d instruction booklet. Otherwise it dries ur skin & burns it! I beg to differ. I hv a very sensitive skin which is combination dry & acne prone. I had used earlier version of Fem in 2000 or 2002. That never suited me & burned my skin, even though I only use it occasionally for weddings. 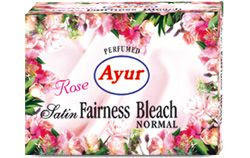 Apparently Ayur Satin Rose is d only bleach that was so calming & moisturising! Hi Anu, the bleach didn't burn my skin, irritate it or dry it. It just didn't work on my skin. Neither did it camouflage my facial hair not did it lighten my skin tone. It's good to know that it worked for you but maybe it didn't suit my skin! Different products work for different peiople. Anyway, I don't use bleach anymore as I am more into DIY beauty aids these days.